During the last week in July 2014, my eighty-one-year-old mother was physically assaulted in a Culver City bus in Los Angeles County. As a regular passenger on the Culver City line, I have never felt threatened. The bus drivers, most of whom are black, are always courteous. Therefore, the news of my mother’s assault came as a shock. With the aid of a walking chair, my mother moves around Los Angeles by bus. When she entered the Culver City bus near her residence, two white women sat facing each other in the front section of the bus. The two seats in this section, reserved for the elderly and physically disabled passengers, fold upwards to accommodate passengers using motorized and other wheel chairs. My mother judged the stout woman to be in her fifties. The other woman was frail and older, probably in her seventies. As is normal during the slack mid-morning period, there were only three other passengers on the bus. Still standing, the stout woman snatched my mother’s walking chair and threw it over. Then, she pushed my mother to the ground and repeatedly banged her head on the floor of the bus. The white female bus driver did not intervene or seek help in handling the assault. The other three passengers looked on in silence. Why did the woman attack an elderly woman? Does she dislike brown-skinned immigrants? Does she hold a grudge against the elderly? Was she venting her rage on a stranger weaker than herself? Is she a mentally unstable individual? I don’t know. Perhaps, my mother was just in the wrong place at the wrong time, caught between a tired and frustrated caregiver and her own mother. Whatever the reason, one thing is certain: we live in a culture of violence. Even the police force, sworn to protect and serve we the people, far too often become the aggressor. On August 9, 2014, in Ferguson, Missouri, an unarmed black teenager died at the hands of a white police officer. The predominantly white Ferguson Police Force broke up the non-violent protest of the black community with teargas and rubber bullets. The excessive use of force against the predominantly black community has erupted into civil unrest. 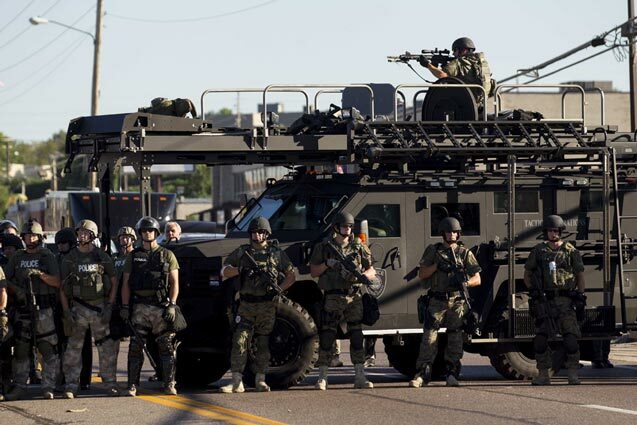 Yesterday, August 16, 2014, the Governor of the State of Missouri declared a state of emergency and curfew in Ferguson. Fueled by fear, anger, and hatred, violence becomes a tornado of our vile human emotions. It destroys everything and everyone in its path. It brings devastation, suffering, and loss. How much longer will we continue to settle our differences with blows, bullets, and bombs? Thanks for sharing my blog post, Cyril. Hope that all is well on your front. …especially when it is not aggravated ! to record incidents like these for evidence gathering. vehicle….which is usually part of their ongoing training. therefore it remains for decisive action by the driver…..
will only make the situation worse on public transport. I agree with your conclusion, Kamtan. Incidents like this will happen again if the transport authorities don’t take action. Thanks for sharing the link, Clyde. On August 11, in South Los Angeles, a 24-year-old black man known to have mental problems was shot by a police officer. I followed the Bundy case. Yes, there’s a different kind of justice for white and non-white offenders or suspects. The gun culture of american society is endemic. enforced the more improved the relations between law enforcement agencies and public will be improved. Right to bear arms the question ? In UK the Bobby on the beat isn’t armed with gun but alternatives are in use…pepper spray…sten guns et al. are in use for obvious reason….it saves lives. hopefully the uniform he/she is wearing. armed or unarmed with guns. hate culture that exist in law enforcement agencies. Unfortunate it wont re-incarnate the dead….but will reduce the pain/suffering of the believed families. Thanks for sharing your spin, Kamtan. There are prominent African-Americans as well as white Americans who are fighting to bring about change. But it’s a long and slow battle. So sorry to hear about your mom, Rosaliene. I hope she is recovering. Thanks for your concern, Dr. Stein. She’s recovering but still shaken. will be ….hopefully the bus driver ! That would never go unpunished or un-disciplined in UK. A lifetime is less than a century….and am on my final lap. HELLO ROSALIENE, IT IS SO DISTRESSING TO READ OF THE MALTREATMENT OF YOUR MOTHER. MY PRAYERS ARE FOR HER RECOVERY. OBVIOUSLY A PERSON OF HER AGE AND DISABILITY MUST BE SERIOUSLY HURT. I AM FROM GUYANA AND OUR CULTURE DIFFERS A LOT FROM HERE IS THE USA.WE ARE KNOWN FOR OUR HOSPITALITY. HOW CAN FELLOW HUMANS JUST SIT AND WATCH AN INNOCENT WOMAN BEING ATTACKED FOR NO REASON.ARE THEY HUMAN? HOPE YOUR MOM RECOVERS FULLY. Carl, thanks for your kind words and good wishes for my mother. For obvious reasons, I don’t wish to go into details regarding her injuries. We have become numb to violence. Also, out of fear for our own safety, we are also reluctant to become involved in such incidents of violence. Rosaliene, sorry to hear your mother was a victim of battery, but glad that she is recovering. It’s unfortunate and surprising no one intervened, especially since your mom was a disabled person. I agree with Compton, the bus driver should have called for help since she didn’t intervene….and she shouldn’t have driven off until police arrived. Yes, we don’t know if the aggressive woman was a disturbed individual, but she was certainly hostile and a threat to others. It takes a mean person to batter a disabled elderly woman. Every day we see or hear of incidents of disrespect, bullying,, discrimination, anger, road rage, violence, police abuse of power, etc. We live in societies where people have hang ups, some may be mentally challenged or chemically imbalanced; we become more sensitized to theses individuals when we become victims or when we get involved with them. We have to be street smart and know our rights, but more importantly, use our best judgment to respond in threatening or hostile situations…. for our own safety. There are a lot of “sick” people among us. As Martin Luther King said, “Injustice anywhere is a threat to justice everywhere.” We must not condone injustice. Deen, thanks for your concern for my mother and your sound advice regarding our personal safety. Surviving in one of Brazil’s most violent cities has taught me how to be alert when walking the streets and using public transport. When we age, we become more vulnerable and easy victims for the “sick” people among us. And to think this is where most people, of colour, aspires to emigrate to. If only they knew…. JJ, sad to say, racism is real and still exists here in the USA. Superiority or inferiority complex or both. Sad world for our survival indeed ! Survival of the most adaptable ! Rosaliene, I finally purchased a new computer; I was out of the loop for awhile. Thanks for sharing your mom’s story. What a horrible incident that was unjustified. Hope you are talking to a lawyer as you put pen to paper. As a movement person, who lived in this part of the world for 51 years, you fight back Rosaliene. You will be making it better for someone else. Pls don’t roll over and play dead. Yes, it was also troubling to see what has happened in Ferguson, MO. This is the ugly America we live in. Sad! I am reminded of Dr. Kings work and all the others who marched with him and died. Thanks for your advice, Yvonne. So happy to hear from you again! I don’t wish to share details here, but know that action is being taken. land of the brave and free. Kamtan, “getting your own back” sounds like revenge. I’m not a vengeful person. I seek only justice and fairness. Time is the Great Avenger. and use the proceeds on private transport for your mum. it sure helps in the search ! I have to agree with de castro’s grandmother’s spin – the first take on that phrase may have been in the 400s BC, in a play by Aeschylus. But Justice remains the key word here – “revenge” may be hard to swallow but what is Justice but a rule of law that civilizes revenge? Angela, I suppose that’s one way of looking at Justice. I prefer to see it as punishment for wrong doing as defined by the rule of law, not getting even (revenge). Realities within the rule of law, as you know, are also harsh – our preferences, surely, do not always match realities but we still must continue. A stimulating round with this blog, Rose. Adding love conquers all our inhibitions ! The law is arbitrary rough justice not !! Sometimes you have to take bull by its horns…. not sword ! As per bullfighting ! then what happens…the matador slays it…. Some say barbarism … Spanish say ‘ole’ ! We live love and learn !